Seeking renewal, she traveled to Oregon’s spectacular coastline for respite. In the process of restoring her health, Pozzi found something else in dire need of healing: the ocean. Moved to action, her 30-year career as an artist and educator of children and young adults kicked in, providing her with a framework to research the many challenges that confront the world’s oceans. She reached the inescapable conclusion that marine debris was choking the world’s oceans and depleting the environments and sea life she had always treasured. That realization touched off a spark of inspiration. Could ocean debris be used to empower others to reduce—or even eliminate—their use of plastics? Pozzi had worked with recycled materials in the 1990s, when she founded Creative Art Supplies to build 3-D art kits from reclaimed materials. 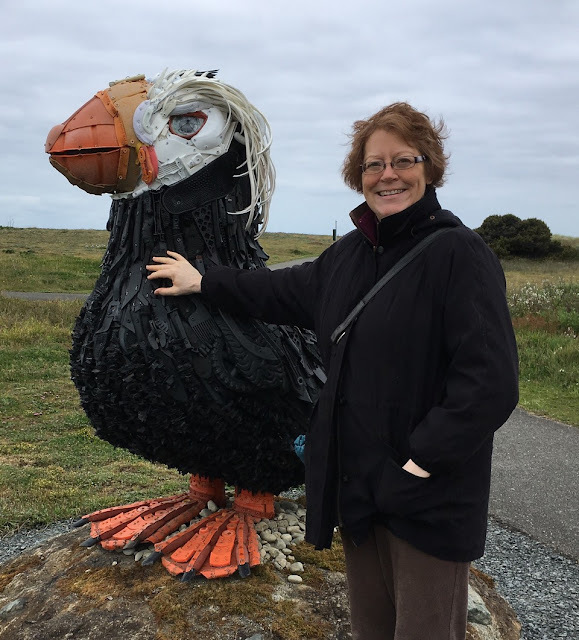 From her coastal home in Bandon, Ore., she decided to enlist the help of local volunteers to clean up the beaches, using the collection of plastic debris to construct sculptures of the sea animals most affected by the pollution. on display at Chicago's Shedd Aquarium, 1 of 7. In 2008, Pozzi founded the Artula Retreat and Residency Program and Arts Institute, which evolved in 2010 into the non-profit Artula Institute for Arts and Environmental Education and the Washed Ashore project. The mission of Washed Ashore is ambitious: Use the arts to educate a global audience about plastic pollution in oceans and waterways and to spark positive changes in consumer habits. To date, hundreds of volunteers have removed thousands of pounds of trash from Oregon beaches, and Pozzi and her dedicated staff have created dozens of giant sculptures that are on display around the country to raise awareness about the threats of marine plastic debris. Displayed at aquariums and natural history museums from coast to coast, the installations are promoted with the tagline “Art to Save the Sea!” and the huge sculptures gather crowds wherever they are shown. A recent trip by PTMSC volunteers to Chicago’s Shedd Aquarium provided an opportunity to photograph some of the jaw-dropping sculptures that are pictured here. Pozzi and her team have also created an Integrated Arts Marine Debris Curriculum to provide resources to educators, volunteers, and staff at all Washed Ashore exhibit locations, focusing on the idea that every action counts and offering tangible ways to change individual and community behaviors. Today we know that plastics of every form are omnipresent in the marine environment. Between microbeads in cosmetics and microscopic fiber strands washed out of synthetic clothing, and styrofoam packaging, disposable water bottles, food containers, utensils and straws -- to name only a few – plastics not only litter our oceans and waterways, they are being ingested by marine animals and the toxins are entering the food chain, ultimately ending up in some form on our dinner plates. 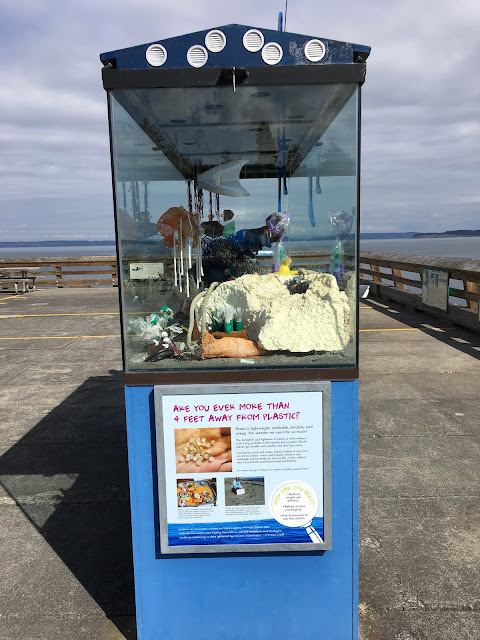 At the Port Townsend Marine Science Center, staff and volunteers are also using plastic debris in creative ways to showcase the perils plastic pollution to visitors, exemplified by the plastic sculptures displayed in the large glass case on the dock adjacent to the PTMSC Aquarium. Because plastic is ubiquitous in our daily lives, we can draw inspiration from individuals like Angela Haseltine Pozziand our own PTMSC staff, AmeriCorps and volunteers to become empowered to stop purchasing single-use plastics, reduce our use of plastics overall and recycle plastics whenever their utility has ended. The power of one empowers many, creating the climate for change, one person at a time!